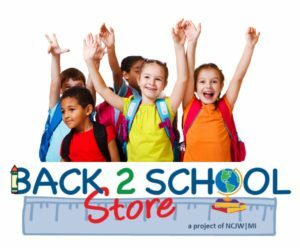 The Back 2 School Store (B2SS) is a one-day annual event held during the month of August. This year it takes place on Sunday, August 18th, 2019. This event supports Detroit students who are in need of the appropriate school supplies to help provide them with a successful school year. 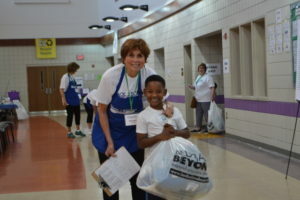 Our pop-up store is designed to look like a department store where each child “shops” with a personal shopper (an NCJW | MI volunteer) for new clothing: shirts, pants, socks, underwear, winter coat, hat, gloves, and shoes. The child also can choose a new backpack, filling it with school supplies and personal care items. Please see this video to find out more about our B2SS. Help kids put their best foot forward!